The four candidates for Georgetown University Student Association (GUSA) President, Nicki Gray (NHS ’20), Norman Francis Jr. (COL ’20), Sina Nemazi (COL ’21), and Ryan Zuccala (MSB ’20) took the stage at the presidential debate in the Healy Family Student Center Great Room on Feb. 5 to answer questions posed by students and campus media. Central themes of the debate included incorporating the views of student advocacy groups into GUSA, the role and perception of GUSA on campus, and the feasibility of candidates’ platforms. The debate began with opening statements from each of the candidates about their platform and vision for the role. Nemazi, who is running with Roya Wolfe (SFS ’21), opened the debate by pointing out that he was the only candidate with any previous GUSA experience, as he served as the chair of GUSA’s dining policy team. He emphasized that he feels his ticket’s platform is the only one with tangible goals that could be achieved over the course of a term. 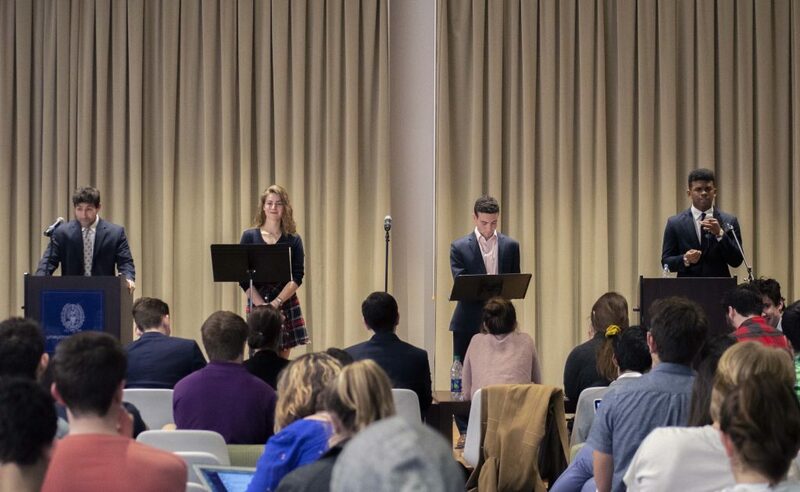 Gray, who is running alone after her former running mate Sam Appel (COL ’20) left the ticket last week, had her first chance to showcase her platform in a debate. She introduced her priorities as making progress on Title IX, supporting issues around the GU 272, supporting student artists, and implementing a cross-departmental approach. She said GUSA was unique in its “potential to be an incubator for student initiated change,” and said she had a plan to reform GUSA. Zuccala, whose running mate John Dolan (MSB ’20) skipped the vice-presidential debate, also had the first chance to explain his platform in a debate. He outlined his three point plan of lowering tuition, enhancing the value of meal swipes, and improving housing. He also asserted that no outsider candidate has won in the last three years, which is why he feels GUSA continues to fail. However, Sahil Nair (SFS ’19) and Naba Rahman (SFS ’19), who emphasized their role as GUSA outsiders in their campaign, won the election last year. Francis Jr., who is running with Aleida Olvera (COL ’20), introduced their platform of transparency, reform, accessibility, and progress, with focus on underrepresented communities. Conversation centered around the role of GUSA on campus and the executive itself. All candidates acknowledged that student trust in GUSA was incredibly low and expressed interest in changing that by bringing in more student voices. Gray spoke to the role of GUSA, saying “student government is one of the only places students can go and make change.” Nemazi said he believed one reason trust in GUSA was so low was because those with no GUSA experience had won past elections and did not know how to use the office effectively. Transparency and policies of past GUSA administrations were also heavily discussed. Though all candidates had only limited specific critiques of the current administration, they felt that the actions of the executive could be better publicized. Zuccala, when asked for a critique, as well as specifics about working with the Senate, said he did not know what GUSA had done and that it had rarely done anything to benefit him. A second issue all the candidates were asked about was incorporating student advocates and activists into GUSA while still allowing them to do their own work. GUSA Senator Logan Arkema (COL ’20) asked about the lack of trust activists often have in GUSA and how that can be mitigated. Gray said she would step back and listen to activists that were already doing work, a sentiment that Nemazi echoed. Francis Jr. promised to be genuine to help activists trust him, while Zuccala said activists should reach out to GUSA and that his campaign was prioritizing students over advocacy groups. Major points of debate based on the candidates’ proposed policies included Title IX reform, lowering tuition, the referendum for a reconciliation contribution to the GU 272, and the LGBTQ Report Card that GU Pride, Queer People Of Color, and the McDonough Alliance released earlier this week. On Title IX reform, all candidates expressed the need to hire a full-time coordinator and to make changes the university implements as public as possible. Nemazi highlighted his ticket’s plan to train Student Advocacy Officers (SAO) to advocate for victims of sexual assault, helping them understand what questions they are required to answer when reporting. Kenna Chick (SFS ’20), current GUSA vice president, said the administration had spoken with the SAO office, and the office had said that policy would take at least ten years to implement. Zuccala spoke about listening to both survivors and the accused, though he said survivors should be believed the majority of the time. Lowering tuition is a main point of Zuccala and Dolan’s platform, which they plan to do by cutting the GUSA discretionary budget. 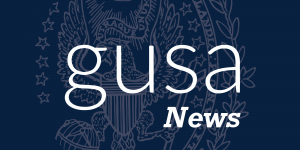 Though they said GUSA had $24,000 in their Fiscal Year 2018 budget that could be cut by 40 or 50 percent, Sen. Hayley Grande (COL ’21) said in a comment to the Voice that the GUSA discretionary budget was only $13,000 and that if it was cut, it would hinder the executive’s ability to see programs through. Other candidates expressed a desire to lower tuition through meetings with the administration. Candidates discussed the resolution passed in the GUSA Senate calling for a referendum to be put to the students this spring, and this referendum entails instituting a reconciliation contribution for the descendants of the 272 slaves sold by Georgetown in 1838. While Gray, Nemazi, and Francis Jr. all expressed support, Zuccala said he felt the contribution should be voluntary, and that it was not the responsibility of the students to pay for the university’s mistakes. He called the contribution a “dangerous road to go down” because of the precedent it would set. The LGBTQ report card that was released ranked the candidates on their knowledge and dedication to LGBTQ issues on campus. Gray, who received the best score (B-) said she acknowledged there were some issues she could be better on. She also added that a member of GU Pride was involved with her campaign. Nemazi, whose ticket had a score of D+, proposed a few issues to improve the housing process for LGBTQ students. Francis Jr. acknowledged that he had failed to fill out the survey and would be releasing his answers online later. Zuccala, who received a score of F-, called the survey ridiculous and said that he planned to represent all students. Gray was asked a question about her former running mate, Appel, and said that they had both decided it was best for him to leave the ticket, though he had come to the conclusion on his own. All the candidates agreed on some issues, such as stopping live registration and accessibility for mental health. The debate ended with an opportunity for each candidate to make a closing statement. Francis Jr. said he would continue to work with students and would be available for anyone to reach out to. Mentioning that campus organizations would not endorse him, Zuccala asked for the votes of students in attendance. Gray promised she would not give up and would continue to push for reform. Finally, Nemazi argued that his and Wolfe’s concrete ideas and passion would be the best combination for GUSA. The four candidates will appear on the ballot that will be on Hoyalink Friday, Feb. 8 for students to vote.